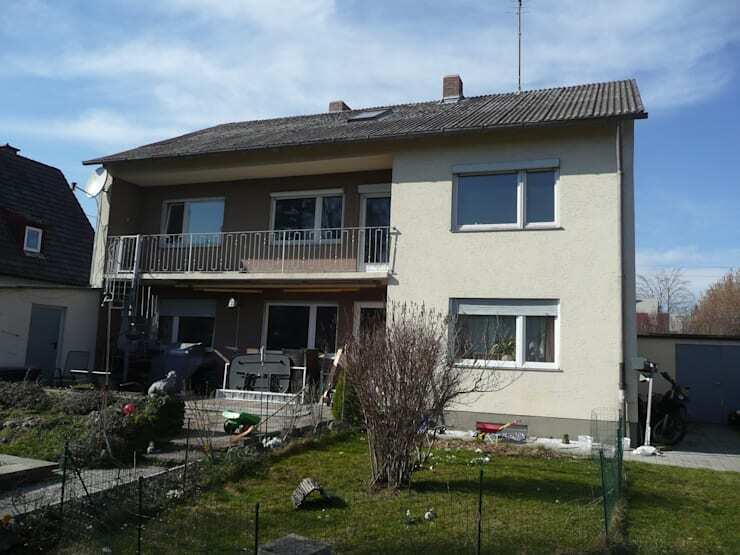 Before, this family home in Furstenfeldbruck was a typical median-income home from the 60s. The home was afflicted with high energy loss through the sloping gable roof, utterly ordinary cheap plaster walls, and low ceilings in the rooms throughout the top floor. 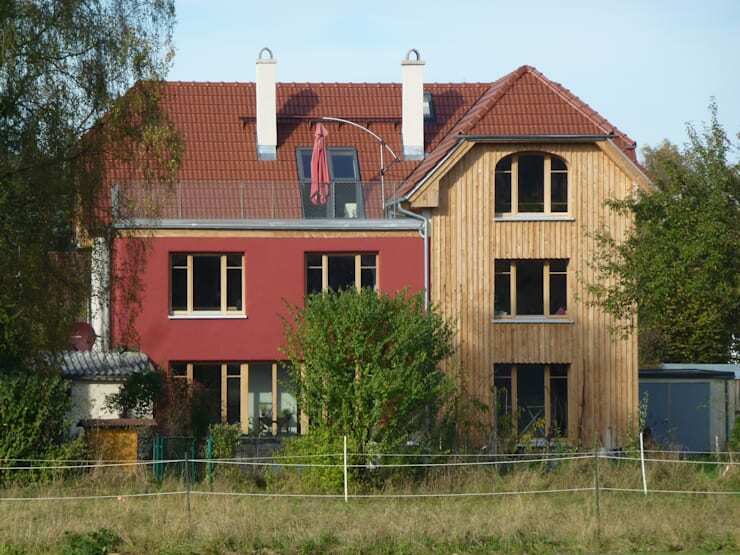 Architects from Bau-Kult-Ur not only made this outdated home into a princely masterpiece, but they also performed an energy conversion as well, turning the home into an efficient, more eco-friendly place. To do this, they've created a completely new building form, added highly efficient insulation to the exterior walls by using straw bales, and created high and bright rooms in the attic (which take advantage of two newly-added roof terraces. This reno job is an example of a major and dramatic upgrade in property value! There's not much to say. This home is a completely ordinary family home from the 60s. Here's a sneak peek at the work in progress. 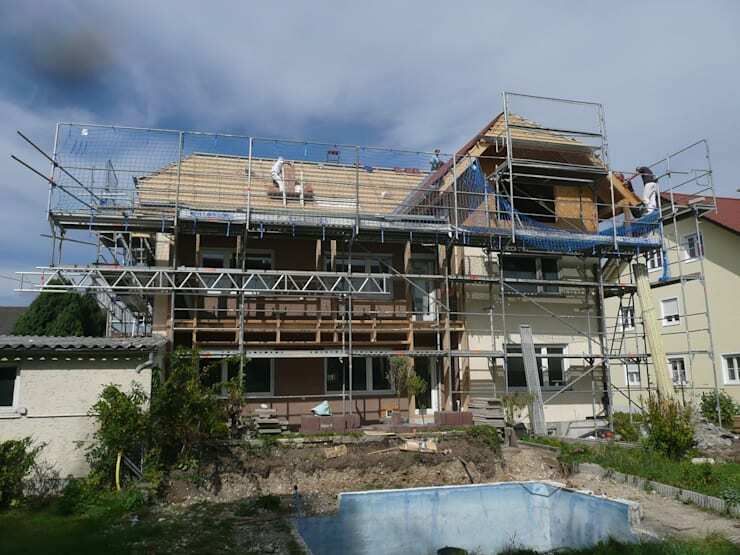 You can see that the basic shape of the home is being maintained, allowing the new home to fit within properly lines. In this image, you can observe the roof as it's being given a higher angle, creating more living space underneath. Not only has this house been given the gift of a lush yard (a far cry from the wire fence, toys, and lawn artifacts that riddled the yard in the before version), the home has been given some warmth and energy with a brand new colorful facade. In rich mauve and golden tones, the home has sprung forth to modernity, away from the boring, fading greys and whites of yesteryear. A wooden tower gives the home a sense of connection to nature, an element that wasn't present in the previous blocky concrete look. 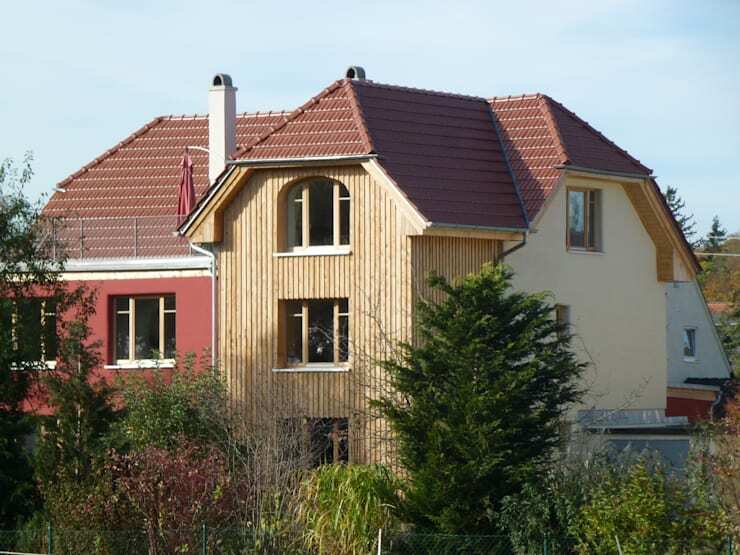 The home has been taken from mediocre to majestic with this princely roof on its shoulders! With a wooden lookout tower and commanding height under a roof reminiscent of terra cotta tiles, the house gains a sense of authority. The home rests in and of itself, gaining a sense of life from its cleverly articulated structure. Where the old windows of the home barely served to call attention, the new windows of the home feature arched frames that lend a soft, organic feel to the home. With the image of a young girl reading a book on the sill, the home takes on a fairytale-like woodland atmosphere. On the inside of this sunny room, you get your first peek at the home's interior. 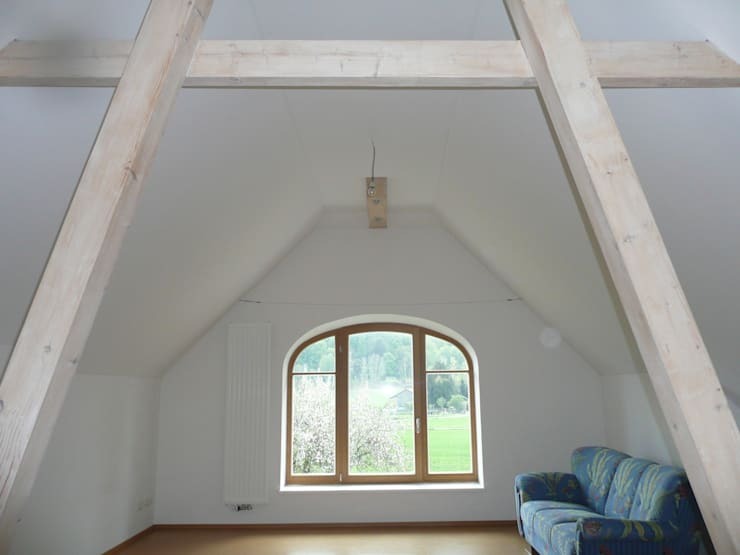 With a new angle on the roof, the upper floor of the home enjoys immense height in all of the rooms – this sun room features an a-frame beam construction that draws even more attention to the room's ample height. 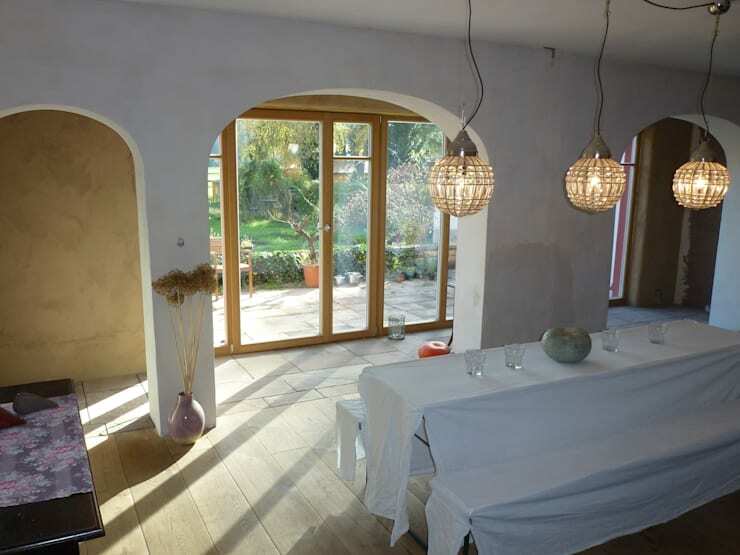 Downstairs, the arched window theme continues in the interior doorways of the home, carrying through the rounded, organic feel from the outside. In this dining area, the architects have created a space within a space as a foyer connects the patio to the interior hallway which runs along the perimeter of the home. This design creates an open dialogue with the hallways that move through the home, while also distinguishing the dining room with a change from floor tiles to wooden planks. 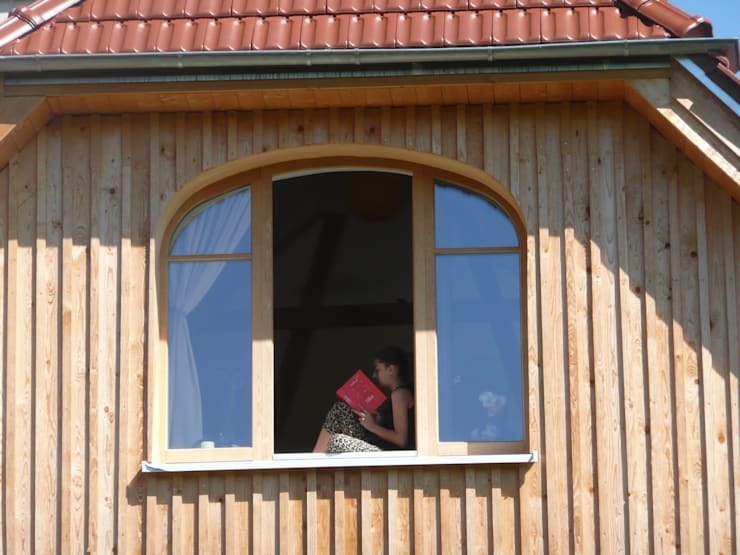 The ample windows of the home now provide plenty of sunlight for the resident family and their guests. This dining room is positively cheerful with light streaming in through the ground floor windows, and the playful juxtaposition of antique and modern features add to this youthful, energetic room. Loving this sunlit space? Pick up some more tips for designing your dining room with the dining room design lesson in this ideabook. It's hard to believe that this home began it's journey as a pressing, harsh, and industrial-looking home. Here, the interior reveals itself to be fresh and light, with light bouncing from various cream and wooden surfaces. 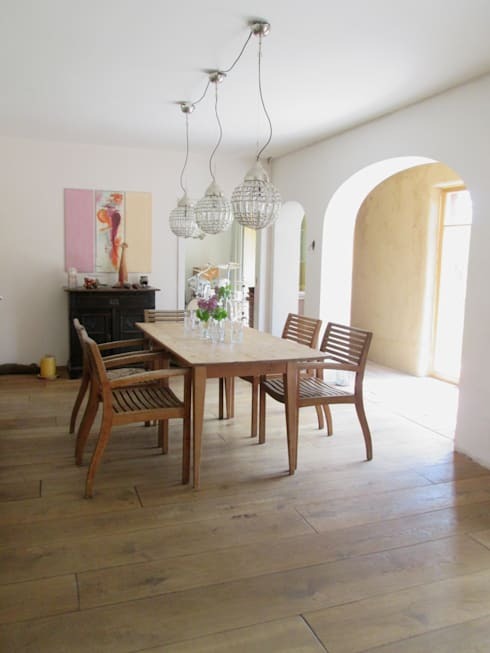 A glance at the floor will reveal that the architects haven't needed to change the original floors of the home, however, they have inserted a thick cushion of straw bales underneath for insulation. 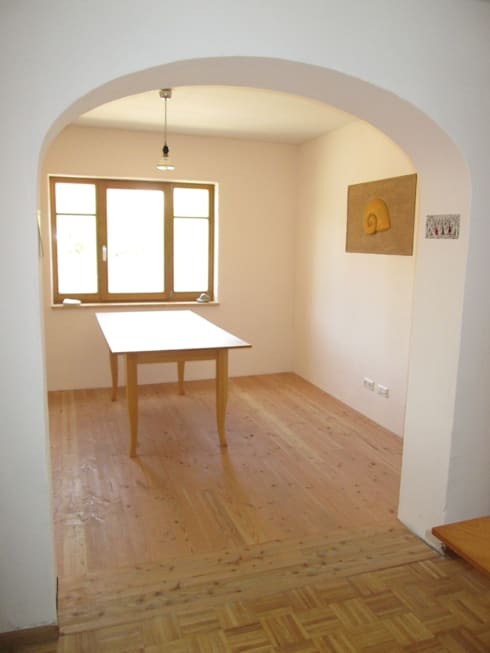 The straw bales are also found in the walls, plastered on the inside and painted with lime paint in neutral cream tones.